Article in the Warren Ohio Tribune Chronicle about Rose Pest Solutions' bed bug canine team Jayna and Kramer. 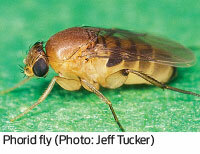 These small flies are a diverse group with many different species. Rose Entomologist Mark Sheperdigian joins an expert group to discuss how to treat them in this article from PCT Magazine. Paul W. Smith and Mark Sheperdigian, Rose Pest Solutions Entomologist chat about the recent Zika outbreak in Miami. Pregnant women and their partners are encouraged not to travel to Miami. They also discuss the Zika Virus threat in Michigan. Rose Entomologist Mark VanderWerp's article which appears in the July edition PCT Magazine talks about the hazards warm weather presents to pest control techs.